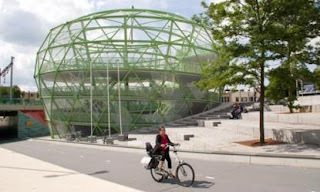 Wednesday 18th August was the opening date for the "Fietsappel" ("Bike Apple"), an unwatched cycle park in the area of the railway station in Alphen aan den Rijn. Travellers and visiters can park their bike for free in this multi storey building of steel in the shape of an Apple. 970 bikes fit within the bike racks in the "apple." The ‘Fietsappel’ was designed by Wytze Patijn of Kuiper Compagnons. The concept is as an artwork of an apple. The floor is a spiral shaped as an apple. The steel artwork has a width of 27.5 metres and a height of 15.5 metres, the sloped floor goes around the "core" which is a steel column. The outside skin is transparent and gives the impression of space. It was a deliberate choice to make the cycle park feel as open as possible to give a good feeling of social safety. At the station there are two other parking facilities for cyclists. Under the stationarea is "De Verbinding", which combines a bike tunnel under the railway line with an underground watched cycle park of 1280 parking spaces and next to it there are now two unwatched cycle parks. The "Kerk en Zanen" with 600 places and the new Fietsappel with 970 spaces. 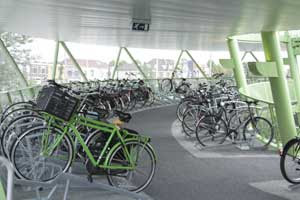 This brings the total number of cycle parking spaces at Alphen aan den Rijn station to 2850. The town has a population of around 72000 people, so there are places for around one in 25 residents to park a bike at the railway station. This is not exceptional, but actually quite normal. It is a similar proportion to other railway stations in the Netherlands - and somewhat different from the situation in London, other places in the UK, and indeed the rest of the world. The Netherlands doesn't just have one or two "cycling cities." It's the whole country. There's quite a collection here of railway station cycle parking stories on this blog. Update Jan 2011: Daniel Sparing visited the Fietsappel and took some photos. A couple of days ago I made a video as I rode home. It was horrible weather. Really a lot of rain. Part way home from work, I realised that it was a good opportunity to show the advantages of cycle paths when the weather is bad so started a camera on the back of my Mango. Being away from motor vehicles in bad weather has a number of advantages. For a start, you have no concerns about "not being seen" by drivers whose vision is obscured by rain, spray or mist. You also remain drier because you are not hit by spray or splashed water from puddles. And you also don't ride over spilled diesel or broken glass from cars. Journeys like this are a world away from the sort of thing that would happen quite regularly to me when I rode on the roads in the UK. If only I'd had a video camera on my bike back then I could easily have had a collection of videos to compare with this chap (or the many others documenting how cycling is in the UK). What's more, such cycling provision brings huge benefits in speed as well. In the just short of 14 km distance covered in the video, which shows part of my 30 km each way commute, I average 36.5 km/h despite headwind and rain. The journey would not only have been less pleasant, but it would have taken longer on the road due to there being more traffic lights, traffic calming, and more things to give way to. This video carries on from about the point that the video in my previous post stopped. The video shows the first part of my ride home from work a few evenings back. My route takes me from the industrial estate on the South East of Groningen towards the south, so I don't see the numbers of bikes that you see during rush hour in the centre of the city. Also it was a wet and windy day. My route is around 30 km in length, about 28 km of which is on cycle paths, not roads. Normally my commute takes about 50-55 minutes - an average speed of 33 - 36 km/h. This is a far higher speed that I averaged on a shorter commute using roads in the UK, but naturally not as high a speed as I can average when racing on a closed circuit. This time I spent more time on the roads than usual because of the road works. The road work signs actually told cyclists to use the normally unidirectional 2.5 m wide cycle path on the other side of the street as a bidirectional cycle path, but I instead rode on the road for a while before going back on the normal cycle path. In the video I edited out almost all the bits where nothing is happening, but left in every interaction with another cyclist or driver. While many kilometres of cycle path are edited out, most of the time I was on road is still in the video. 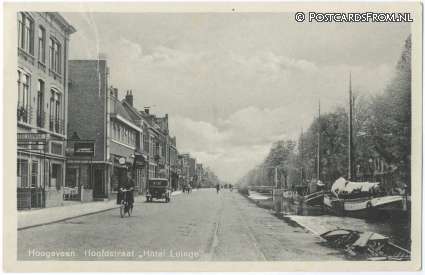 The velomobile parked outside the shop at the start of the video belongs to Marcel Prins. We had an interesting, though short (it was time to go home) conversation and he had some complaints about the route he took to Groningen from Leeuwarden. Nothing's perfect, of course, including conditions for cycling in the Netherlands. Personally, I find that the surfaces are not so smooth and that I get lost when I head west into Friesland as the signage seems not to work so well either. However, it's all relative. Much of what is "bad" here would still be pretty good by the standards of many other countries, both with regards to infrastructure and the behaviour of drivers on the roads. While this sort of thing happened to me fairly frequently when riding in the UK, it's never happened here. The scene of the first video with rather more bikes can be seen here. The first video was made using a remarkably cheap and effective video camera. Another example video and instructions how to buy it can be found here. 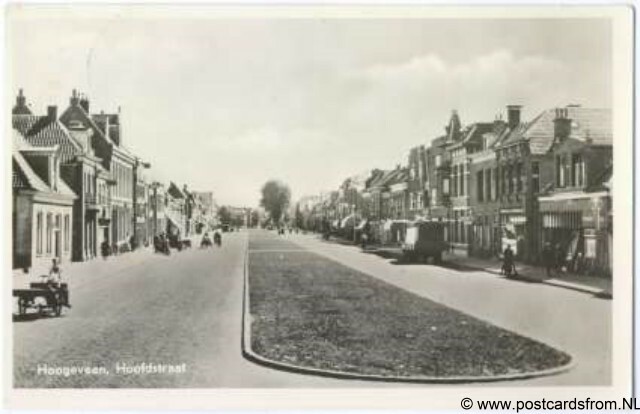 Last week I showed what the centre of Hoogeveen now looks like. I also made a video on the way home again. The company from where I buy the racks is 35 km from my home, along a route which follows the main road between the two towns. The video shows a representative section of the trip back home, which is mostly on separate cycle path but also some access roads (with little or no cars on them, but the occasional tractor) and a short stretch on road through a village. This is quite normal for riding between towns on routes which haven't been improved further. I rode the Mango, pulling an empty trailer there, which was full of bike racks on the return trip, so I've now got a good stock of those again. As usual, this was a straightforward and uneventful journey, with no nasty surprises over the 80 km (including the detour to the centre to make the film for last week). That's just how it is. This film is a bit similar to one I made two years ago on the same journey, but despite the trailer not helping the aerodynamics, it was somewhat quicker this time around with the Mango. 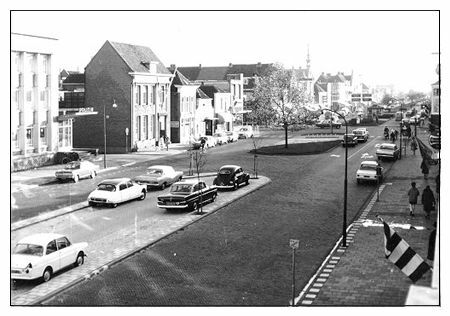 Another of Mark Wagenbuur's excellent videos, showing the design of a typical traffic light junction in the Netherlands and how it differs from the design in other countries. This type of design not only increases safety of cyclists, but also the important subjective safety required to make people want to cycle, and want to let their loved ones cycle. The Netherlands has the highest cycling rate in the world, so more vulnerable road users than other countries, yet also the safest roads in the world. It is infrastructure like this which has achieved such a level of safety for cyclists. Note that in most cases a cyclist can make a right turn without stopping at the traffic lights. This is usually the case even where there isn't such an obvious cycle path on which to do it. As a result, even junctions which require a cyclist to stop twice to make a left turn provide cyclists with equal average speed through a junction to when riding on the road. At many modern junctions it is not necessary to wait twice to turn left, so cyclists get to stop less frequently than drivers. This blog has more examples of traffic light junctions and cycle paths in the Netherlands (and elsewhere). A few days ago, Steve Ellis, another British resident of Assen got in touch and told me about his experimental "air trike" - a Sinner Comfort modified with the chain only turning a propeller on the back, and with no drive through the wheels. Of course I had to go and take a look, and a test ride. It's a strange experience. Initially there is very little resistance to the pedals. While at a standstill, the propeller is very inefficient and it takes a while to get moving. However, once you're moving the system is quite a bit more efficient and a reasonable speed can be maintained. I know that Steve has some other ideas in mind, so I look forward to future developments. I've now ridden my Mango 10000 km since I first rode it, just under eleven months ago. That's about 910 km per month. I calculated before I left work today that I'd be a couple of km short of the magic figure if I rode home the usual way, so I took a detour through Assen to make up 2 km extra, and 10000 rolled onto the computer just as I passed my home. It's been used for many day rides and a few races as well as my regular commute, and it's really worked very well for all these things. The luggage space inside has been used for shopping, for vegetables I've bought from stalls at the side of the cycle path on my way home from work, and for my tent and sleeping bag when I've gone further from home. It's also pulled a trailer when there has been more to carry. As I commuted all through winter (and also the Dutch summer), I've ridden my Mango through snow and rain, and it's also provided some some shade from the sun on days when the temperature was 37 C.
The Mango has done all these things, and done them all very well. It's just wonderful to be able to go faster for the same effort, even into headwinds which would otherwise be a bit dis-spiriting. This evening there was a strong head/side wind on the way home, but it didn't stop me cruising at 38-39 km/h without any difficulty at all. And what does 10000 km represent in terms of fuel consumption for a car ? Well, if instead of riding in the Mango I'd driven our quite average car this distance then it would have consumed about 730 l (160 gallons / 192 US gallons) of petrol, costing over 1000 euros (about 90 euros per month), which would have put 1680 kg of CO2 into the atmosphere. My 60 km round trip commute would have consumed about 4.5 l per day, about 7 euros per day, and produced about 10 kg of CO2 for each commute. If we'd invested €25000 or so in a shiny new "green" Toyota Prius, I'd have been able to get away with burning only about 2/3rds as much fuel. And to repay the loan over 5 years would cost around 500 euros per month and fuel cost around 60 euros per month. Instead, with my €5500 Mango I've not had to buy any fuel at all, and if I had a loan then the repayments would have been similar to just the fuel cost for a car. My Mango consumes no fossil fuels (not even indirectly at a power station) and produces no CO2 emissions. It's the true green alternative, and it also keeps me fit - saving on the cost of the gym which perhaps I might have subscribed to if I lived in another world and didn't cycle regularly. Governments around the world encourage people to sell existing cars and buy slightly more efficient models. Where is the comparable government help to buy a truly green vehicle ? Sometimes people express concerns about the environmental cost of the glass fibre, epoxy, polyester, aluminium etc. used in construction of a velomobile. They're right to do so, as all these things do have a high embedded energy cost, and yes, there are some nasty chemicals involved as well. However, to build a car uses more of everything. The Mango necessarily has to be efficient with the low energy input available from a human (more than 100 W over a long period of time is difficult) vs. that available from an engine or motor (1 horsepower ~= 745 W, and powers over 100 hp are not uncommon for cars - i.e. cars can have 3 orders of magnitude more power available). The Mango weighs only around 30 kg (it depends on the model). This is necessary as rolling resistance and acceleration are dependent on weight, and it must require far less energy to move than a car. If the Mango weighed 1000 kg, it would take a huge effort ever to exceed 10 km/h (there's a calculator here that you can play with). The low weight also means the embedded energy cost is lower simply because fewer materials must be used. Now a couple of things that I've changed about my Mango more recently. Several months ago I bought one of Peter's small lights to mount near the mirror. It took me ages to get around to mounting it on my Mango last week, but I'm very pleased with the result. While the small light doesn't consume much electricity, and can't light up the road like the IQ Speed mounted in the front of my Mango, I can aim this light higher without dazzling oncoming cyclists and motorists and it is really very obvious from a distance. Both the IQ Speed and the small "daylight" LEDs in the front of my Mango are also lit in this photo, but the brightest from this angle is the small light next to the mirror. I think it makes the Mango easier to see (to those people for whom 2.5 m of bright yellow simply isn't enough...). It does this while drawing very little current so having a very slight effect on the battery. Finally, for a couple of weeks I've had an annoying clonk noise with every push on the pedals. One after another, I've been tightening up this and that around the Mango and the clonk noise remained. Today at work Harry suggested it might be the bottom bracket bearing cups being lose. I tightened them and... At last - near silence again ! I'd not even considered these because they weren't obviously lose and I couldn't see where enough movement could come from to make a noise. If you've a mysterious clonk noise when pedaling on a bike with this type of bottom bracket, try tightening up the cups. You can find out more about the Mango on the manufacturer's website. Yes, I do work there, but I do so because it's really a great product. Update: I stopped working for Sinner in 2011 to concentrate on our own business. Still ride the Mango, though. I was of course hoping for 1000 km per month in the Mango. However, I ride other bikes as well, and my personal total is easily over 1000 km per month if these are included. We bought petrol today. It's quite a novelty for us, as we don't do it very often. The last time we bought petrol was way back on August 27th... 2007. I've mentioned before that we're not really all that enthusiastic about driving, but today we made a short journey in our car and needed to fill up the tank. It made me think: what exactly have we bought today ? Our tank full of fuel came to a bit more than 36 and a half litres. 36.5 l of petrol weighs about 26 kg. Burning that one tank full of petrol will put about 84 kg, a little more than my own weight, of CO2 into the air. That's the effect from just one tank full of petrol, which according to the manufacturer is supposed to be enough to drive around 500 km. Petrol is amazing stuff. It has an energy content of 9.7 kWh per litre, so today we bought 355 kWh of energy for our 53 euros. The car consumes about 0.7 kWh produces 0.17 kg of CO2 per km driven. A few years back, someone who set a world record by cycling over 1000 km in 24 hours calculated that his average power output was about 115 W for the entire 24 hours. That's someone at the absolute peak of what is possible, and his body generated about 2.7 kWh over a 24 hour period. In light of this, I think it's reasonable to say that an averagely strong person doing an 8 hour shift at a physically demanding job would expend no more than 1 kWh per day at work, so we could say that in our tank full of petrol we've bought the equivalent of someone working hard nearly every day for an entire year, including weekends and almost all holidays. This cost just 53 euros. That really is a bargain. Car manufacturers put a lot of effort into insinuating otherwise, but cars are actually quite amazingly inefficient. It seems no-one is really all that interested in making them any more efficient. Petrol provides an awesome amount of energy for a remarkably small cost, and pushing gently on the accelerator makes a car zoom along quite nicely. Anyone who's ever pushed a car any distance knows that there is nothing particularly efficient about it. There is much hype over electric cars, even though they do little more than to shift the source of the output of that CO2 elsewhere. Many power stations are still coal power stations. In fact, many new coal power stations are still being built, all around the world. When you burn coal at a power station you get only about 2 kWh of energy per kg of coal burnt. If instead of filling up a petrol car today we had charged batteries of an electric car with the same amount of energy by using electricity generated by coal, it would have required the burning of no less than 177 kg of coal, producing a whopping 518 kg of CO2 in the process. That's over 6 times the amount produced by burning petrol directly in a car. An equivalent electric car therefore would still consume about 0.7 kWh but produce over 1 kg of CO2 per km driven. That's being quite generous, as you never get so much energy out of a battery as you put into it when you charge it. With NiMH batteries, for instance, you get back out only about 2/3rds of the energy you put in - under ideal conditions. Electric bicycles are also not so innocent as many people think. According to this pro electric bike website it costs 1.8 kWh in electricity to charge an electric bike battery for a 20 mile (32 km) range. That's nearly 1 kg of coal per charge. Even with their figures, which like mine for electric cars ignore the problem of inefficiency of rechargeable batteries, this indicates that an electric assisted bicycle, powered by electricity from coal, consumes about 0.05 kWh and produces about 0.08 kg of CO2 per km ridden. Yes, so electric bikes, if charged by electricity generated by coal (in Australia, for instance, 80% of electricity comes from coal, and the majority of the rest from other fossil fuels), have a CO2 output per km which is only about half that of an average car with one occupant. Public transport isn't all that much better either. The average bus occupancy in the UK is only about 9 people. Due to this, figures you can calculate for overall efficiency for the entire bus network are actually remarkably similar to those for single occupancy cars. The same happens with trains. Only if you assume that electric trains take all their electricity from carbon neutral sources do they look particularly good. High speed trains are remarkably close in emissions to jet aircraft. As you can see, changing from one of these modes to another is really only about making a small change. Anyone who tells you that one mode of powered transport is incredibly more efficient than another is either selling you something, or is misinformed. However, it's big business (much like oil is) and there are plenty of people with a vested interest in trying to convince you that their motorised car replacement can change the world. Lots of things are described as "green" but few genuinely are. There is a truly "green" alternative to these modes of transport. It's called a bicycle. No fuel is burnt. No CO2 emissions result. You do have to eat, however from what I've seen, people who drive don't eat any less than people who cycle. All bicycles are wildly more efficient than powered vehicles. They have to be. Inefficiency makes you tired too quickly (compare pushing a bike with pushing a car). However, some bicycles are still more efficient than others and this makes a huge difference if you need to travel more than short distances. A truly "green" car-replacement for longer journeys looks like this ! The sharp eyed might notice we went to a BP station. I know some people are boycotting them, but frankly it's a waste of time doing so. In my opinion there is very little to choose between oil companies. They're all doing their best to make as much profit as possible from extracting oil from wherever they can get it, and they are all responsible for spills. BP was simply unlucky enough to have had their disaster where it was widely seen and reported upon. Boycotting one chain won't do any good. What really needs to happen is for people to appreciate what an amazing resource both oil and coal are, and to consume less of them. 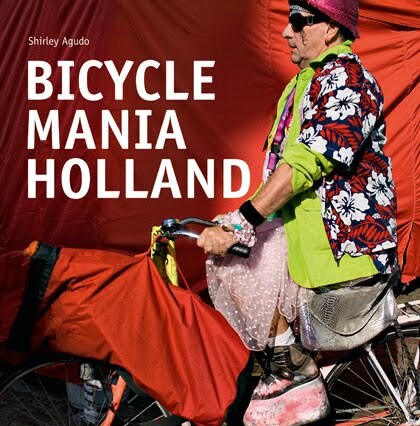 A few weeks ago I met Shirley Agudo, the author of "Bicycle Mania Holland." Shirley is American. She originally came to this country due to work, but when she had a choice, she chose to live here. The photos, taken by Shirley herself and three contributing photographers, are really rather wonderful. They're very varied, and show every type of person on every type of bike in every type of weather, carrying every type of impossible cargo. But most of all, they're pleasing on the eye. The accompanying text gives a short and easily read introduction to cycling in the Netherlands. Why it happens, what other countries could learn from Dutch practice. The website of the book is here, and it can be ordered from Amazon at this link.